Gange Wadiya is stunningly beautiful and can easily be promoted as a tourist destination. Because this village is situated close to the lagoon birds and animals unique to the region and migratory birds can also be seen. Birds migrate to this area from other countries during the migratory season. 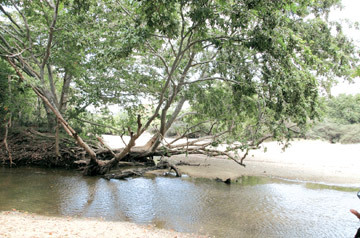 If the authorities take necessary steps the entire area including the lagoon can be developed into a nature attraction. A beautiful view of Kumbuk tree. 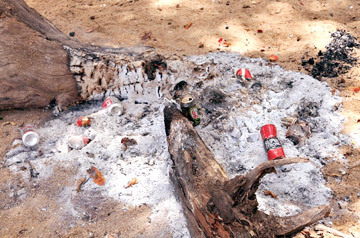 Beer cans and other disposals have been burnt using huge logs causing damage to the environment. A view of mangrove forest in the lagoon. Gange Wadiya is situated in the Puttalam district along the Mannar road close to Eluwankulama in the Wilpattu National park border. This is an attractive location to promote tourism. The Fisheries industry is the main livelihood of the people who live here. A large number of Muslim families live in Gange Wadiya. This village was under LTTE attack at one time. Some villagers said after attacking Anuradhapura, terrorists escaped to the Wilpattu forest through Gange Wadiya. Now the Navy has set up a camp in Gange Wadiya. It comes within the administrative boundary of Wanathawilluwa Divisional Secretariat Division. Public Transport is not available to this village. Three-wheelers, motor cycles and bicycles are used by the people for transportation. Eventhough this area is not familiar to foreigners, local tourists visit in large numbers. 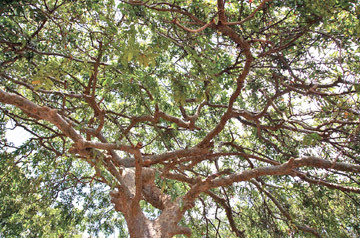 Because Gange Wadiya is located close to the Kala Oya invaluable Kumbuk trees are found all around the area. Those who visit this area cause severe damage to the environment by throwing polythene bags, food waste, beer cans and bottles. 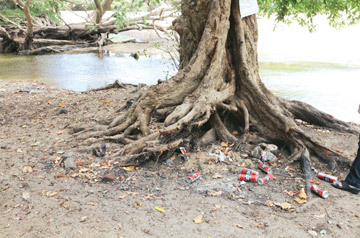 Garbage which is collected from the area is burnt under the roots of the Kumbuk trees which are hollow. Due to such activities, a large number of Kumbuk trees unique to the area are destroyed. Many trees have already died. The Fisher community lives in the village and undergo immense hardship in getting drinking water. They go to the Malwathu Oya to take water for drinking. Drinking water is given to families in this village but it is not sufficient. People can be seen going in canoes with vessels to take water along the Malwathu Oya. Although it is a beautiful sight it causes immense hardship to the villagers. Women in the region go fishing in canoes with their husbands. If pollution by visitors continues, Gange Wadiya will definitely lose its natural beauty. Environment activists should come forward to protect its biodiversity while providing facilities to local tourists. 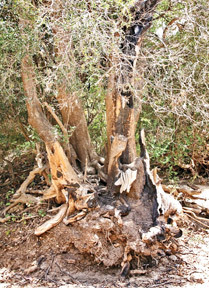 Ancient Kumbuk trees are found in the banks of the Kala Oya and other places in Gange Wadiya, damage caused to the environment must be stemmed. Investment Promotion Minister Lakshman Yapa Abeywardena plans to promote tourism in the Gange Wadiya area. Youth who visit the Wilpattu National park hunt animals for food. Due to this rare animals such as rabbits, deer, jungle fowl and other animals are gradually diminishing. Wild elephants can be seen roaming in the night on the way to Gange Wadiya. Entrance is free. If a nominal amount charged from visitors, the area will turn into a popular tourist area. A program has been initiated to keep the Gange Wadiya area clean . The BOI has started a program to distribute dustbins in the Gange Wadiya. "We have instructed the Wanathawilluwa Pradeshiya Sabha to keep dustbins in suitable places where people gather in large numbers". The Wanathawilluwa Pradeshiya Sabha has been requested by the BOI to deploy an officer to monitor the activities in the Gange Wadiya area. W. Emmanuel a resident of Gange Wadiya said that it is clear that there are intentions to turn the area into a tourist resort and it would bring a better livelihood to people while providing a large number of direct and indirect jobs. "We are not poachers, we are fishermen and regard this place as our home, despite the fact that even basic facilities are not available. Even drinking water is brought using canoes from sources 5 km distant. "In 1996 the LTTE raided this place and killed 16 innocent people in the village. There were women and children among the victims. "At that time no one was willing to come to these areas, but today with the dawn of peace, Gange Wadiya is gradually turning into a tourist destination" Emmanuel said. With the re-opening of the Wilpattu National Park the number of tourists travelling to the area has increased. 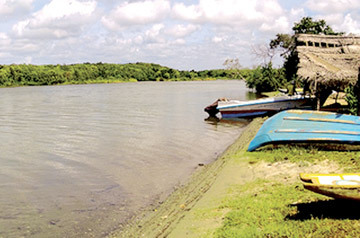 Although there are no tourist hotels in the vicinity, around 300 tourists from the Kalpitiya area visit the estuary by boats. This was a dilapidated house and a disused well surrounded by elephant dung. We later found out that it was a forest department bungalow and was abandoned due to LTTE threats in the Wilpattu jungle. To our amazement, there was a green hammock tied between two trees and we immediately jumped onto it. It was like floating on a pool and felt heavenly. The Navy who spent days and nights to protect the people from LTTE attack, now provide training to navy officers to protect the people from natural calamities. After the elimination of terrorism Navy officers in Gange Wadiya camp are involved in social service. A lifeguard and diving team operate in the camp. When sudden disaster situations arise they transport medicine and essential food items to victims. Boat facilities have also been given to these officers for rescue work. Moves are underway to promote environment-friendly tourism in this area where the Kala Oya merges with the lagoon. It is also intended to popularise aquatic games and provide training to divers. There are 200 people working in the camp including officers, Commander Kosala Wijesooriya is in charge of the camp.